Yankee Doodle Dandy (1942) is one of Hollywood's greatest, grandest and slickest musicals. The nostalgic, shamelessly-patriotic, entertaining film also supported the war effort as it paid tribute in its mostly fictional story to a popular Irish/American entertainer and the grand American gentleman of the theatre in the early 20th century. The timeliness of its release, just after the attack on Pearl Harbor in late 1941, helped the 'propaganda machine' of going to European battlegrounds overseas with a song that was a rousing theme song written years earlier for WW I - Over There. And a second song, You're a Grand Old Flag, contributed to morale-boosting, flag-waving patriotism and love of one's country. And it was the first time that a living US President (FDR in this case, played by Jack Young) was portrayed in a motion picture. Yankee Doodle Dandy is a lively, sensational and dynamic film with exciting song and dance numbers and a tour de force performance by the high-pitched and energized James Cagney. The film tells the musical rags-to-riches life story and times of early 20th century entertainment legend George M. Cohan, following several generations of the Cohan family from the time of young Cohan's vaudeville training on the road, through to his later success on Broadway (with the production of 40 Broadway shows and many hundreds of songs), and ending with his retirement and a comeback in the theatre in I'd Rather Be Right. The tough-guy Cagney persona, most remembered in earlier Warner Bros. gangster films (such as in The Public Enemy (1931), G-Men (1935), Angels With Dirty Faces (1938), and The Roaring Twenties (1939)) was completely revolutionized with the charismatic actor playing an ebullient, stiff-legged, egotistical hoofer speaking from the side of his mouth and successfully grabbing for the American dream, although he had been in an earlier Busby Berkeley backstage musical titled Footlight Parade (1933). The part was originally offered to hoofer Fred Astaire, but turned down, and then offered to Cagney by Cohan's suggestion. The film was a major box-office success for Warner Bros - it became the second highest grossing box-office hit of the year for Warners (after Desperate Journey (1942)). For the first time in his entire career, James Cagney attended the premiere for one of his films. Hungarian-born Michael Curtiz' direction (Curtiz was the famed director of Casablanca (1942) - released in the same year), Ray Heindorf's musical arrangements, photography by James Wong Howe, and the screenplay by Robert Buckner and Edmund Joseph all contributed to making this a top-notch piece of film-making. The film received eight Academy Award nominations and was awarded with three wins: Best Actor (James Cagney), Best Sound Recording (Nathan Levinson), and Best Scoring of a Musical Picture (Ray Heindorf and Heinz Roemheld). The other five nominations included Best Picture, Best Supporting Actor (Walter Huston), Best Director, Best Original Story (Robert Buckner), and Best Film Editing (George Amy). For his own favorite performance in a film, Cagney became the first actor to receive an Academy Award for a musical performance. [Note: Luise Rainer, Best Actress winner for The Great Ziegfeld (1936), and Alice Brady, Best Supporting Actress winner for In Old Chicago (1937), were in films with musical numbers, but their roles were non-musical.] It was also Cagney's sole Oscar-winning performance in his career. The film lost the Best Picture Oscar to the similarly-patriotic (albeit British) Mrs. Miniver. Similar to George M. Cohan's own family that acted together as "The Four Cohans," Cagney's real-life sister Jeanne acted in the film as his younger sister Josie Cohan and his brother William was associate producer (in an independent company). The screen's musical biography of Cohan followed a long cycle of biographies (or 'biopics') that Warner Bros. had produced throughout the 30s - many of which starred Paul Muni (Disraeli (1929), The Story of Louis Pasteur (1935), The Life of Emile Zola (1937), Juarez (1939), and Knute Rockne - All American (1940)), and was the first in another series in the 40s of biographies of composers (Rhapsody in Blue (1943) - George Gershwin, This is The Army (1943) - Irving Berlin, and Night and Day (1946) - Cole Porter). In the musical bio film The Seven Little Foys (1955) about famed vaudeville star Eddie Foy (portrayed by Bob Hope), Cagney reprised his role as George M. Cohan in a cameo appearance - in a classic duet scene in which Hope tap-danced on a table-top to the tune Yankee Doodle Dandy. 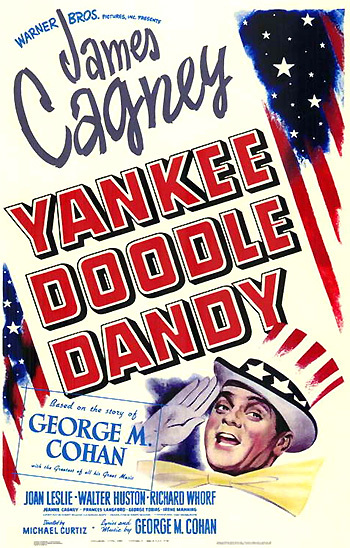 As a side piece of history, when Yankee Doodle Dandy was first released for its world premiere on Memorial Day, 1942 on Broadway, further special engagements were also scheduled around Independence Day (Cohan's alleged birthdate). Rather than tickets for its NY premiere, the studio sold war bonds and reportedly raised $5 million for the war effort. [Note: Due to Cohan's terminal illness with cancer, the original release date of July 4th was changed and moved earlier. As a sidenote, Cohan died in November of 1942.] The black and white film was one of the first computer-colorized films released by entrepreneur Ted Turner in 1985 (again on Cohan's alleged birthday July 4th - naturally!). First critic: I call it a hit. What'll your review say? Second critic: I like it too. So, er, I guess I'll pan it. First critic: Oh. (He laughs.) Well, that's logical. Second critic: My publisher resents Cohan impersonating the president of the United States. Says our young readers dream of being president. First critic: 'I'd rather be right than be president...' Cohan may find out he isn't either one. Cohan: Well, that's all very well, but we're still treading on dangerous ground. You know we're imitating the President of the United States. A lot of people aren't gonna like it. Well-wisher: It's all in good, clean fun. Didn't they enjoy the try-out in Boston? George: Never could do anything wrong in Boston. Mary: The greatest man in the United States played by the greatest actor. There's nothing wrong in that. Especially when the greatest actor is my husband. The President of the United States requests that you call upon him at your earliest convenience in regard to a personal matter. Kindly reply for definite appointment at White House. Not knowing the purpose of the invitation and his summoning by the President, George is a bit worried and anxious and thinks he is going to be chastised: "What did I tell ya? Comin' at a time like this with everything he has on his mind. This is not just a casual invitation. This is important. I think we're in trouble." Mary assures him that he doesn't have anything to fret over: "Don't worry, dear. They don't telegraph you to come and be shot at sunrise." Butler: Well, it musta been thirty-some years ago. I was valet for Mr. 'Teddy' Roosevelt. He got me a seat up in the gallery. The play was George Washington, Jr., and you was just singin' and dancin' to all about the grand ole flag. Mr. Teddy used to sing it in his bathtub. George: That was a good old song in its day. Butler: Yas, sir, it was. And it's just as good today as it ever was. President: Well, hello there! How's my double? George: Your double isn't any too sure. You gotta give me time to work on that one. President: Why, I was told that you knew all the answers. George: There was a time when I thought so. Right now, I wish I did. President: Yes, so do I. President: I'm sorry I missed the opening of your show. George: Maybe it was just as well. President: Don't worry about it. We understand each other perfectly...The Herald Tribune says that you make a better president in I'd Rather Be Right than I am. George: Don't forget, that's a Republican newspaper. President: I can remember you and your family very well - the Four Cohans. George: Do you really, Mr. President? That was a long time ago. President: Yes, it was while I was attending school near Boston. George: (smiling to himself) I was a pretty cocky kid in those days - a pretty cocky kid. A regular Yankee Doodle Dandy, always carrying a flag in a parade or following one. President: I hope you haven't outgrown the habit. President: Well that's one thing I've always admired about you Irish-Americans. You carry your love of country like a flag, right out in the open. It's a great quality. George: I inherited that - I got that from my father. He ran away to the Civil War when he was thirteen - the proudest kid in the whole state of Massachusetts. President: So you've spent your life telling the other forty-seven states what a great country it is. Larry O'Leary is me name. By trade I am a dancing master. Nor teach it any faster. If you watch ev'ry twist, ev'ry turn. At the dancing you have yet to learn. After the song, he disappears into the wings and asks expectantly: "Has any message come for me yet?...I gotta get out of here. I gotta find out what's happening....My wife never held up a show in her life." Backstage are other actors and performers, the stage manager, and one actor in blackface. Still amusingly-dressed in his costume, Jerry runs out the back stage entrance into the alley, discovers his way across the street is blocked by the crowd on the sidewalk and the parade, and is labeled as Irish by one of the holiday marchers - a blue-uniformed veteran of the Civil War: "The Irish are all at the head of the parade as usual." Tense as he struggles to get through, he hops on a caisson-drawn wagon, whispers something into one of the veteran's ears, and is quickly dashed away. Jerry: What do you say? Doctor: Well, seeing that he arrived on the Fourth of July, what about George Washington Cohan? Jerry: Well, it has a nice patriotic ring to it, all right. (To his wife) What do you think? Nellie: Well - the George is fine - but the Washington - may be too long for a billboard. Jerry: How about a nice short Irish name - Dennis or Michael? Nellie: (slowly) George - Michael - Cohan. Yes, I like that name. I guess the first thing I ever had my fist on was the American flag. I hitched my wagon to thirty-eight stars. And thirteen stripes. You know, I was six or seven years old before I realized they weren't celebrating my birthday on the Fourth of July. Then my folks got a real break when my little sister, Josie, made her entrance. She grew to love show business just as she loved everybody and everything. We toured the kerosene circuit in a tank show called 'Daniel Boone on the Trail.' Everybody doubled in brass. Dad walloped the bass drum. For some reason they teamed me with a donkey. I was a good Democrat, even in those days. Mother and Josie threw out handbills. Their smiles would have sold tickets to wooden Indians. They kept putting new stars in the flag and the Cohans kept rushing out to meet them. We had jokes to match every cornfield. We sang at every milk station. Young "MASTER GEORGIE" (Henry Blair at age 7) is a child performer, doing "Violin Tricks and Tinkling Tunes" in his family's vaudeville show, and singing the same number and wearing the same outfit as his father did in the earlier number. He plays his violin while it rests on the top of his head. His cute younger sister's (Jo Ann Marlowe at age 6) solo performance is prefaced with an easel card: "LITTLE JOSIE COHAN - America's Youngest Skirt Dancer" - she sings part of "Strolling Through the Park One Day." We trouped through depression and inflation. Part of the country's growing pains. We froze in winter and roasted in summer. But it was a good life. It's a lucky family that dances together every day. [The family dances in blackface together.] Eighteen ninety-one found our fortunes flat as a pancake. Then came a bolt from the blue. Jobs for the whole family in a play called Peck's Bad Boy. We opened in Brooklyn. The town was noted for its spirited audiences. Even before it had a ball team. At the Brooklyn Theater, a huge billboard reads: "OPENING TONIGHT - The Brooklyn Theatre presents THE COHANS in 'Peck's Bad Boy' - A Rolicking Comedy." A five-pointed star is nailed to a door - now the young boy George (Douglas Croft at age 13), who is the one hammering the gilt star to his own dressing room door, has become a cocky 'Peck's Bad Boy' - the precocious boy has learned his part way too well. Thanks, but what are you all so surprised about? You could've told during rehearsals that I'd be a sensation in this part. Listen, there's nothing to this acting business. I wonder what took me so long to become a star.